G-CAS! Sew Excited! : I Can't believe I did it again!!! 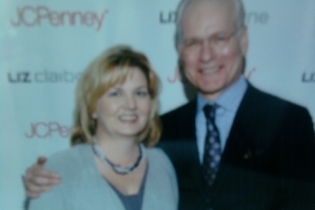 My friend got to meet Tim Gunn Saturday!!! He was here at a local mall for Liz Claiborne. I was invited but had to pass. What the hell was I thinking?! Anyhoooooo (HUGE Sigh). . . Here she is with the man of many words! That's ok, I'll get my picture one day! I'll make it work! Bet That!